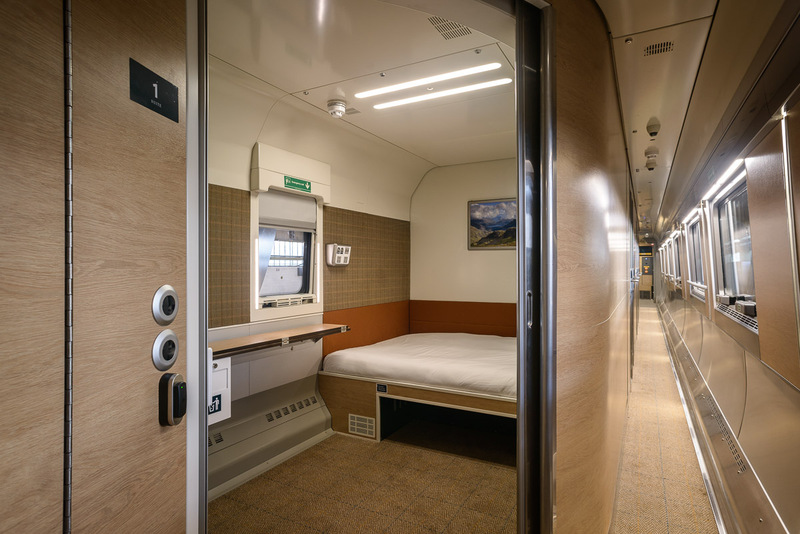 Accessibility is embedded in everything we do, with our new Accessible Rooms created to give you peace of mind while ensuring a complete Caledonian Sleeper experience. Comfort is assured, with our accessible rooms boasting a premium mattress from Glencraft – holders of a Royal Warrant. That means you can sleep like a King or Queen, as Glencraft’s luxurious mattresses have been serving the Royal Family for four generations. We have worked closely with experts from The Shaw Trust to ensure that we’ve maximised our offering, not only in the accessible rooms but throughout the train. With a range of accessible accommodation, we are committed to ensuring our accessible guests have the space they need to travel comfortably and safely between London and Scotland. Our accessible double room has direct wheelchair access to the Club Car through a wheelchair accessible gangway, and the Club Car also has dedicated wheelchair space. Guests in our twin accessible rooms can order from our extensive room service menu. We also have a dedicated wheelchair space in our Seated Coach on our new trains. If you have accessibility needs and book into our Seated Coach, we will reserve this space, and the nearest Comfort Seat, for the duration of your journey with us. Guests in our Seated Coach can order from a dedicated food and drink menu and are served at their seat. The rooms themselves are spacious and wheelchair friendly, with two alarms installed to ensure maximum peace of mind and a lower sink and larger table than in other rooms. Immediately outside each room is an accessible toilet, allowing you to freshen up with ease. Whether you are travelling yourself or with a friend or partner, you will be able to take full control of the room. A thermostat allows you to control the temperature – ideal on wintry nights or when the sun shines in the summer – while a dimmer means you can also find your ideal lighting level. We are determined to enhance our offering to accessible users, which is why we have built accessible shower facilities at our new station lounges, in addition to those already provided by operators of other stations. At Inverness, Dundee, Fort William, Leuchars, Perth and Stirling, you will be able to disembark the train before refreshing yourself before taking on the day. You can choose between the Accessible Double, which comes with a double bed, the Accessible Classic, which features two single (bunk) beds, or the dedicated wheelchair space in our Seated Coach. Looking for help in planning your journey? The interactive Access Map allows you to view all stations across Britain and identify whether they are accessible. Details include whether stations have step free or partial step free access and what facilities are available at each station, including accessible toilets and changing places.